With hundreds of deaths from three-wheeler accidents every year, a top transport expert declared police had no effective strategy for tackling the causes of accidents. Police simply reacted to individual accidents, said Professor Amal Kumarage, Senior Professor at the University of Moratuwa’s Department of Logistics and Transport and a Fellow of the Chartered Institute of Logistics and Transport. “Accidents have patterns, causes, reasons,” Dr. Kumarage said. “Accident prevention must identify these reasons and target law enforcement at such causes.” “In most instances police are unable to catch the most dangerous drivers on the road. They have no strategy that works effectively,” Prof. Kumarage said. “Speed alone is not the cause for accidents. Dangerous overtaking and aggressive driving with unsafe speed while packing in more than three passengers are the main causes. Illegal removal of the locking mechanism in three-wheelers was also a major cause of accidents, he said. A three-wheeler could usually turn about 60 degrees, but slowly and gradually. Without the safety lock it could make a 90-degree turn with hardly any change in speed. “This could hurl passengers out of the three-wheeler, or the vehicle could topple, endangering the life of the driver as well,” Prof. Kumarage said. Police statistics show that a quarter of accidents involve three-wheelers. 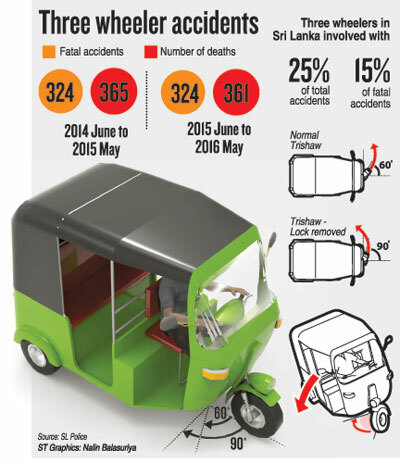 Last year, 324 persons died due to 3,859 three-wheeler accidents caused mainly because the vehicles were overloaded, carrying more than three passengers. Deputy Inspector General (DIG) of Traffic Amarasiri Seneratne said that many spot fines were collected from drivers for carrying more than three persons but still drivers continued the practice. The driving test conducted by the Department of Motor Traffic for three-wheeler drivers was far from satisfactory, transport experts noted. There was a lack of theory tests, especially on road rules, road manners and courtesy. There were no tests in busy cities or roads and no testing was done at night although police statistics reveal most three-wheeler accidents occur between 4pm and 8pm – mostly on Fridays, Saturdays and Mondays. He pointed out that at 70kph the shortest distance in which a driver could stop a car was 96 metres (315 feet), which includes thinking distance and braking distance. Automobile Association Secretary Devapriya Hettiarachchi said driving licences were being issued to young people without proper training. “If we take the recent accidents into account, many young drivers are people with less than five years’ driving experience after getting their licence,” he said. The AAC has a driver training school which offers tutelage to drivers in organisations that have more than 30 drivers, Mr. Hettiarachchi said, explaining, “We give them ‘defensive training’ on how to drive without accidents”.